6.8.1.1 Construction of a parallelogram given the length of 2 adjacent sides and a diagonal. In a parallelogram, opposite sides are equal. If lengths of 2 adjacent sides are given, we can arrive at the lengths of all sides. Thus, the construction is similar to that of a quadrilateral with 4 sides and 1 diagonal given (Refer 6.6.1). 6.8.1 Exercise 1: Construct a parallelogram whose adjacent sides are 5cm and 3cm and diagonal is 6cm. 6.8.1.2. Construction of a parallelogram given the length of 2 adjacent sides and an angle. Thus, the construction is similar to that of a quadrilateral with 4 sides and 1 angle given (Refer 6.6.1). 6.8.1 Exercise 2: Construct a parallelogram PQRS, given PQ=5cm, QR=4cm and PQR = 700. 6.8.1.3. Construction of a parallelogram given the length of two diagonals and intersecting angles between them. 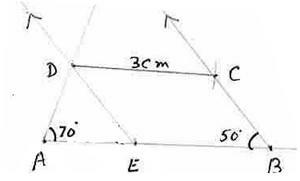 6.8.1 Problem 1: Construct a parallelogram whose diagonals are 4cm and 5cm and the angle between them is = 700. First draw a rough diagram of ABCD with AC and BD as diagonals. From O, draw an arc of radius 2.5cm on both sides of AC to cut the above line at B and D. Join AB, BC, CD and DA. ABCD is the required parallelogram. 6.8.1.4. Construction of a parallelogram given the length of one side and two diagonals. parallelogram bisects each other. Then extend these other two sides. 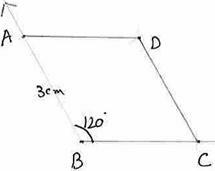 6.8.1 Exercise 3: Construct a parallelogram ABCD with BC=4.5cm and diagonals AC=4cm and BD=5.0cm. 6.8.1.5. Construction of a parallelogram given the length of adjacent sides and the height of parallelogram. Draw 2 perpendicular lines XY and PQ on BC at any two points U and T on it. 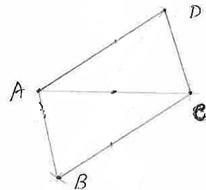 ABCD is a parallelogram with AB||CD, BC||AD and AB=CD, AD=BC. 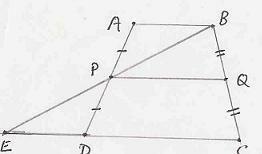 From D and C draw perpendiculars to AB (extend if necessary). 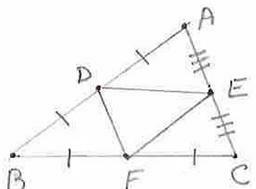 Let them meet AB at E and F.
DE and CF are the altitudes of the parallelogram. Since AB||CD, altitudes are equal (DE=CF). and hence AE=BF and hence Area of ADE = Area of BFC. 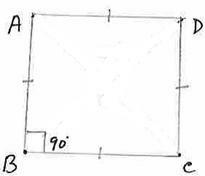 6.8.2 Problem 1: ABCD is a parallelogram with AB=24cm and AD=16cm. The distance between AB and DC is 10cm. 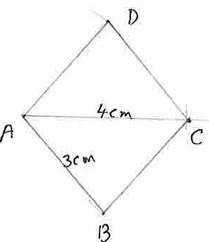 Find the distance between AD and BC. The distance between AB and DC is the height (DE). This is also the area of the same parallelogram with AD as the base and AH as the height. 6.8.2 Problem 2: A rectangle and a parallelogram have equal areas. The sides of the rectangle are 10m and 14m. 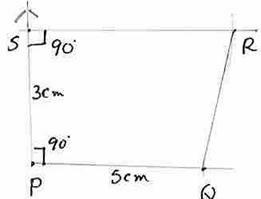 The base of the parallelogram is 20m. What is the altitude of the parallelogram? 6.8.2 Problem 3: A triangle and a parallelogram have equal areas and equal bases. What is the ratio of their altitudes? = 1/2(Base *Altitude) = 1/2(BT*HT). Since the areas are same, Bp*Hp=1/2(BT*HT). Since the bases are same, BP= BT. 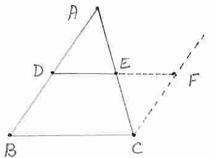 Therefore the altitude of the triangle is twice the altitude of the parallelogram. 6.8.2 Problem 3: Have you observed your mother, grandmother or those who make sweets cutting .Burfis in the shape of parallelogram than rectangles? For example let the sides of rectangle and parallelogram be 13 and 12 units. they can cut more number of pieces in the shape of parallelograms than in the shape of rectangles. We have seen that, to construct a parallelogram we need three elements (suitable combination of sides, diagonals and angles). Because of the special property of rhombus, only two elements are enough to construct a rhombus uniquely. 1. Length of two diagonals are given . (From P and R, draw arcs of radius more than half the length of PR, on both sides of PR. Let they cut at X and Y. From O draw an arc of radius 2cm to cut OY at Q(OQ=2cm). PQRS is the required rhombus. to cut the above arcs at D and B. Join AB, BC, CD and DA. 6.8.3 Problem 3: Construct a rhombus ABCD with AB = 3cm and ABC = 1200. From A and C, draw arcs of radius 3cm to meet at D. Join AD and DC. We have seen(in 6.6) that a diagonal of a rhombus cuts the rhombus into 2 congruent triangles. In the rhombus PQRS, draw the diagonal PR and QS. 6.8.4 Problem 1: The longer diagonal of a rhombus is greater than the other diagonal by 10mts. The sum of diagonals is 32mts. Find its area. Let the shorter diagonal be x. Since the longer diagonal is greater than the other diagonal by 10mts, its length will be x+10. Since the sum of diagonals is 32m. Hence its diagonals are 11 and 21(=11+10) meters. 6.8.4 Problem 2: The perimeter of a rhombus is 40cm and one of its diagonal is 16cm. Find the other diagonal and area of rhombus. Thus in PQRS PQ = 10cm. 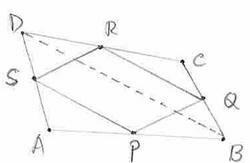 As PQRS is a rhombus, diagonals bisect each other perpendicularly (PO=OR and QO=OS). 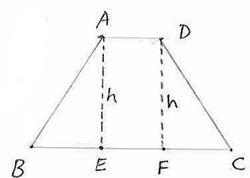 Trapezium can be thought of as a figure got by merging a triangle with parallelogram. we require a maximum of four elements to construct a trapezium uniquely. 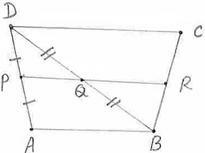 Draw a line through B at an angle of 500 to AB. From D, draw an arc of radius 3cm to cut the above line at C (DC=3cm and ABC = 500). Join DC. ABCD is the required trapezium. Note: In step 4, we used the property of corresponding angles being equal when a transversal cuts two parallel lines (Here DE cuts AB and CD). 6.8.5. 2. When lengths of parallel sides and the altitude are given. 6.8.5. 3. When lengths of all sides are given. Since trapezium can be thought of as consisting of a triangle and Parallelogram first construct a triangle of three sides like what is explained in 6.8.5 Problem1. Since in an isosceles trapezium non parallel sides are equal, we have BC=AD. (DA=2cm, AB=7cm, BC=2cm and CD=5cm). 1. With AD=2cm (given), AE = 3cm (construction) and DE = CB = 2cm (parallelogram), we should be able to construct the triangle ADE. 2. From B, draw an arc of radius 2cm and from D draw an arc of radius 5cm to cut at point C. Join DC and CB. 3. ABCD is the isosceles trapezium. 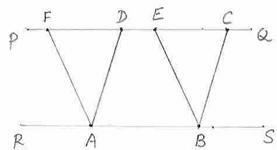 ABCD is a trapezium with BC||AD and AB=CD. Draw perpendiculars from A and D to the base BC to cut BC at E and F respectively. find the length of parallel sides. It is given that the height of the trapezium is 6cm. Since parallel sides of the trapezium are in the ratio of 2:1, let the sides be 2x and 1x. The parallel sides of trapezium are 15cms and 30cms. 6.8.6 Problem 2: The area of a trapezium is 204sq cm. Its altitude is 17cm and one of the parallel sides is 16cms. Find the other side. Area of trapezium = 1/2*17*(16+8) = 17*12 = 204 sq cm which is as given in the problem. 6.8.7 Theorem 1: The diagonals of a parallelogram bisect each other. Data: ABCD is a parallelogram. The diagonals AC and BD meet at O. This proves that the diagonal of a parallelogram bisect each other. 6.8.7 Theorem 2: Each diagonal divides a parallelogram in to two congruent triangles. This proves that the diagonal divides the parallelogram in to two congruent triangles. Corollary means a result/effect of a main event. The main event here is Independence Day. Corollary to that is, it is a holiday. Similarly, based on Theorems we derive Corollaries. 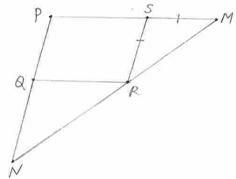 6.8.7 Corollary 1: In a parallelogram, if one angle is a right angle then it is a rectangle. 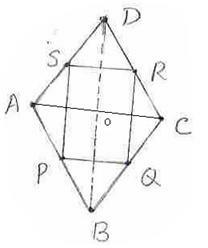 6.8.7 Corollary 2: In a parallelogram, if all the sides are equal and all the angles are equal, then it is a square. 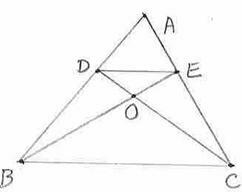 Given: ABCD is a parallelogram and AB=BC=CD=DA. Since it is also given that all sides are equal, ABCD is a square. 6.8.7 Corollary 3: The diagonals of a square are equal and bisect each other perpendicularly. Hence the diagonals of a square bisect each other at right angles. 6.8.7 Corollary 4: The straight line segments joining the extremities of two equal and parallel line segments on the same side are equal and parallel. 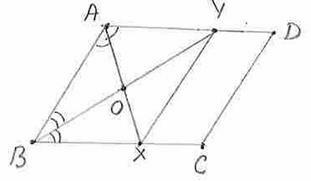 Since DAC and ACB are alternate angles with respect to the lines AD and BC with AC as a transversal, AD||BC. 6.8.7 Problem 2: In the adjoining figure, the bisectors of angles of a parallelogram ABCD enclose PQRS. 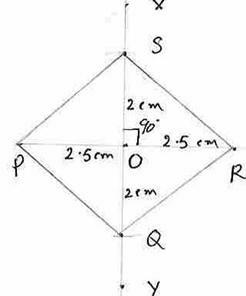 Prove that PQRS is a rectangle. Given: ABCD is a parallelogram. AP, BP, CR and DR are the angular bisectors of angles A, B, C and D respectively. To Show: PQRS is a rectangle. Hence PQRS is a rectangle. 6.8.7 Problem 3: PQRS is a parallelogram. PS is extended (produced) to M so that SM = SR and MR is extended to meet PQ extended at N.
6.8.7 Problem 4: ABCD is a parallelogram. The bisectors of A and B meet BC and AD at X and Y respectively. Prove that XY=CD. 6.8.7 Theorem 3: Parallelograms standing on the same base and between same parallel lines have equal areas. To prove: Area of ABCD = Area of ABEF. Congruent triangles have equal area. Adding area of quadrilateral DEBA to both sides. If equals are added to equals, then the resulting sums are also equal. of FEBA and ABCD are equal. Since the parallelograms, FEBA and ABCD have the same base AB, it follows that the parallelograms have same area. 6.8.7 Corollary 1: Parallelograms standing on equal base and between same parallel lines have equal areas. the altitudes of EFGH and ABCD are equal. it follows that the parallelograms have same area. Area of ADB = half the area of parallelogram. Note : So far we have been using the formula for area of a triangle = 1/2 base *height, without proof. In the process of proving above corollary, we have also arrived at the formula for calculation for the area of triangle. 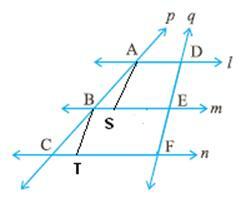 6.8.7 Corollary 3: Triangles standing on the same base and between same parallel lines are equal in area. In addition, we know that the distance (h) between any two parallel lines is always fixed. Hence ABD has the same height ‘h’ as ABC. Theorem 3 and 6.8.7 Corollary 2. 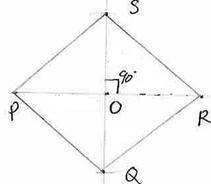 6.8.7 Corollary 4: Triangles standing on equal base and between same parallel lines are equal in area. (By formula, area of triangle is half of its base and height). BC is the common base for both BCD and BCE. 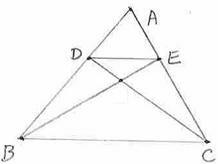 Both triangles have same height as DE||BC. 6.8.7 Problem 7: In the given figure, D and E are the points on the sides AB and AC respectively, such that the area of BCE = Area of BCD. 6.8.7 Mid-Point Theorem: The line joining the mid points of any two sides of a triangle is parallel to third side and is equal to half the third side. To prove: DE||BC and DE=1/2BC. 6.8.7 Problem 8: Prove that the figure obtained by joining the mid points of adjacent sides of a quadrilateral is a parallelogram. 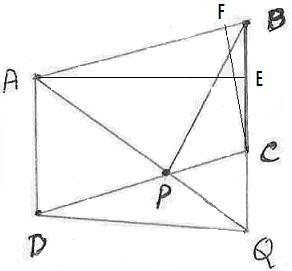 Given: P, Q, R, S are the mid points of AB, BC, CD, DA respectively, of quadrilateral ABCD. Firstly, follow the steps described above to show that PQRS is a parallelogram. of lengths of the parallel sides. 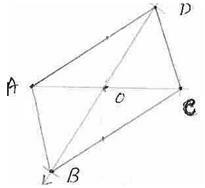 6.8.7 Problem 11: D, E and F are midpoints of AB, AC and BC of an isosceles triangle ABC in which AB=BC. 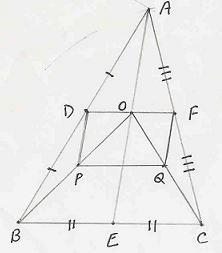 Prove that DEF is also isosceles. To Show: DEF is an isosceles triangle (any two sides in DEF are equal). 6.8.7 Intercept Theorem: If three or more lines make equal intercepts on one transversal, then they make equal intercepts on any other transversal. Given: Transversal p makes equal intercepts (AB=BC) on three lines l, m and n.
(i.e. l || m || n) q is another transversal which makes intercepts DE and EF. Construction: Draw AS and BT parallel to the line q.
OB and OC respectively. 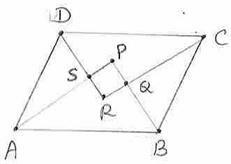 Prove that DPQF is a parallelogram. 6.8.7 Problem 13: In a trapezium ABCD, AB||DC, P and Q are mid points of AD and BC respectively. BP produced meets CD produced at point E.
Prove that P bisects BE and PQ||AB. Hint: Use the following properties/statements to prove all of the above theorems after drawing diagonals if required. 1. SSS/ASA/SAS postulates for congruency of triangles. 2. Alternate/Corresponding angles are equal when lines are parallel. 3. In an isosceles triangle angles opposite to equal sides are equal.